If there was ever an artist who deserved to be featured in a column called Dark Dreams, it's the late HR Giger, whose dark artistry penetrated the psyche of all of mankind after he designed the nightmarish Alien creature for the wildly successful Ridley Scott sci-fi horror film. Hans Rudolf Giger was a Zurich-based surrealist painter, best-known for linking humans and machines together in a 'biomechanical' relationship that emphasized the dark, emotionless side of technology. The Swiss artist's uniquely grotesque and darkly sexual visions, first created with an airbrush and later in pastels, markers, ink and oil, were adapted to various forms of commercialized media including film, album artwork, interior design concepts, and tattoo design. Switzerland boasts two Giger themed bars reflecting his interior designs while his work remains on permanent display at the official H.R. Giger Museum at Gruyres. In a 2009 interview with Vice he credited Samuel Beckett, HP Lovecraft, crime writer Edgar Wallace, and his childhood fears amid World War II as key inspirations for his work, which has been described as a mix of gothic decay with serpentine futurism. HR Giger was born in 1940 in Chur, the capital city of Graubünden, to a pharmacist who viewed art as a profitless waste of time and encouraged his son to follow in his professional footsteps. Instead Hans went on to study architecture and industrial design in Zurich. Giger's first big break came in 1969 when H.H. Kunz, the co-owner of Switzerland's first poster publishing company, printed and distributed Giger's first major works. From then up until his passing he had a massively successful and influential career in both art and interior design. 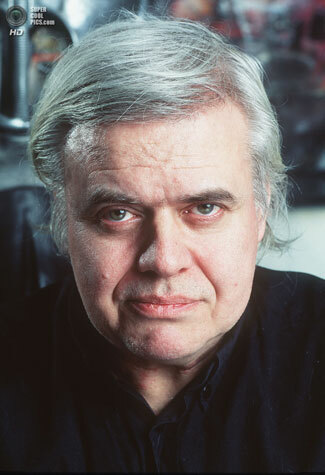 His books of paintings, particularly Necronomicon and Necronomicon II (1985), as well as the regular appearance of his art in Omni magazine helped Giger rise to international prominence. Working with ink, oil paint, and an airbrush Giger brought graphic and disturbing images of dark sexuality and damnation not seen since Hieronymus Bosch. His work also features elements that would later be determined to be precursors to the cyberpunk movement of the late 80's and 90's, even influencing movies like The Matrix. But Giger's presence in Hollywood reaches back long before the rise of the Wachowski's. In 1975 Hans was hired for the film adaptation of the science fiction fantasy novel Dune by fellow eccentric dreamer Alejandro Jodorowsky. The film was slated to star Salvador Dali as the lead, after accepting an offer of $100,000 per minute of screen time. Jodorowsky also hoped to cast Orson Welles as Baron Vladimir Harkonnen, who agreed only after the director convinced a gourmet chef to prepare Orson's meals for him for the entire duration of the show. The laundry list of big name celebrities with extravagant demands (along with a script that would produce a 14-hour movie if shot as written) eventually sank the production. By the time the production was shut down Jodorowsky had spent $2 million of the $9.5 million budget! The rights were eventually sold to Dino de Laurentiis and David Lynch was hired to direct the version which was released in 1984 with just a fraction of Giger's original designs. A few years later Giger would cross paths with Ridley Scott and be brought on to help with Alien. Giger's painting Necronom IV, which depicts a gorgeous monster with a humanoid body and grotesquely phallic skull, left a big impression on Ridley Scott, so much so that he used it as the inspiration for his award winning sci-fi horror film. Giger's contributions include the infamous xenomorph chest explosion scene, the peeling alien eggs, the spacecraft design, and the grotesquely masked 'Space Jockey' gunner discovered inside. But not everyone was convinced they were on the right track. In fact the film's producer Gordon Carroll reportedly described the artist's work as "sick". Scott on the other hand was absolutely blown away by what Giger had dreamed up. He'd later tell anyone who would listen that he thought he was making the best movie of his life. "I'd never been so certain about anything in all my life," he reportedly said to cast and crew alike.